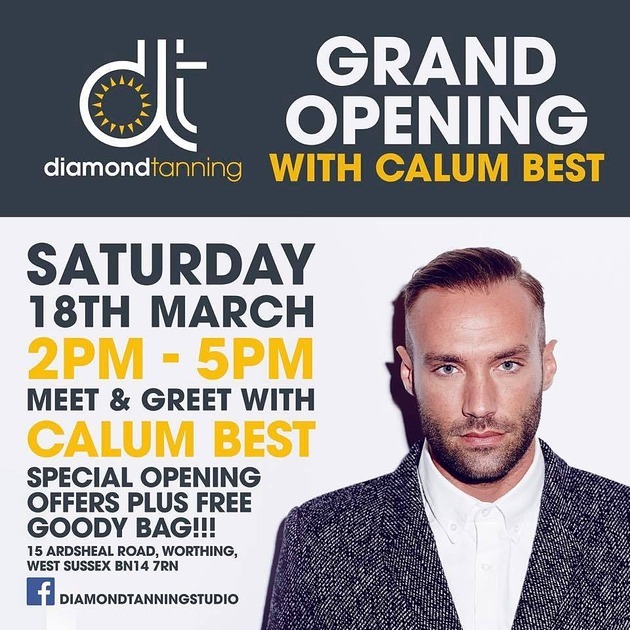 A brand new premium tanning salon is opening in Broadwater this month and they are pleased to announce that Calum Best will be there to cut the ribbon! Diamond Tanning will be hosting their launch day on Saturday the 18th of March from 2pm – 5pm. The salon will also be featuring specialist light therapy sunbeds which are known to help improve a number of skin conditions and complaints, full information will be available on the day. Salon owner Lois Hallett is also thrilled to announce that Beth Sayers, HD Brow Master Stylist and Mia Clark, Make Up Artist; will be working alongside her to deliver a one stop shop for all your beauty needs. On arrival guests will receive a complimentary glass of Prosecco and a chance to meet Celebrity Big Brothers Calum Best! There will also be fantastic opening offers available and a free goody bag for the first 100 people!